The Toronto Star is a Canadian broadsheet daily newspaper. Based on 2015 statistics, it is Canada's highest-circulation newspaper on overall weekly circulation; although it is a close second to The Globe and Mail in daily circulation on weekdays, it overtakes the Globe in weekly circulation because the Globe does not publish a Sunday edition. The Toronto Star is owned by Toronto Star Newspapers Limited, a subsidiary of Torstar Corporation and part of Torstar's Daily News Brands division. 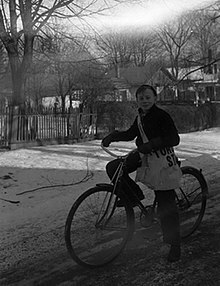 The Star (originally known as the Evening Star and then the Toronto Daily Star) was created in 1892 by striking Toronto News printers and writers, led by future Mayor of Toronto and social reformer Horatio Clarence Hocken, who became the newspaper's founder, along with another future mayor, Jimmy Simpson. The Star was first printed on Toronto World presses, and at its formation, The World owned a 51% interest in it as a silent partner. That arrangement only lasted for two months, during which time it was rumoured that William Findlay "Billy" Maclean, The World's proprietor, was considering selling the Star to the Riordon family. [a] After an extensive fundraising campaign among the Star staff, Maclean agreed to sell his interest to Hocken. The paper did poorly in its first few years. Hocken sold out within the year, and several owners followed in succession until railway entrepreneur Sir William Mackenzie bought it in 1896. Its new editors, Edmund E. Sheppard and Frederic Thomas Nicholls, moved the entire Star operation into the same building used by the magazine Saturday Night. This would continue until Joseph E. "Holy Joe" Atkinson, backed by funds raised by supporters of Sir Wilfrid Laurier, bought the paper. The supporters included Senator George Cox, William Mulock, Peter Charles Larkin and Timothy Eaton. Atkinson was the Star's editor from 1899 until his death in 1948. The newspaper's early opposition and criticism of the Nazi regime saw it become one of the first North American papers to be banned in Germany. a "radical" in the best sense of that term.... The Star was unique among North American newspapers in its consistent, ongoing advocacy of the interests of ordinary people. The friendship of Atkinson, the publisher, with Mackenzie King, the prime minister, was a major influence on the development of Canadian social policy. Atkinson became the controlling shareholder of the Star. The Star was frequently criticized for practising the yellow journalism of its era. For decades, the paper included heavy doses of crime and sensationalism, along with advocating social change. From 1910 to 1973, the Star published a weekend supplement, the Star Weekly. Besides, we are the Star which means we all have the Atkinson Principles—and its multi-culti values—tattooed on our butts. Fine with me. At least we are upfront about our values, and they almost always work in favour of building a better Canada. From 1922 to 1933, the Star was also a radio broadcaster on its station CFCA, broadcasting on a wavelength of 400 metres (749.48 kHz), whose coverage was complementary to the paper's reporting. The station was closed following the establishment of the Canadian Radio Broadcasting Commission and the introduction of a government policy that, in essence, restricted private stations to an effective radiated power of 100 watts. The Star would continue to supply sponsored content to the CRBC's CRCT station (which later became CBC station CBL), an arrangement that lasted until 1946. In 1971, the newspaper was renamed the Toronto Star and moved to a modern office tower at One Yonge Street by Queens Quay. 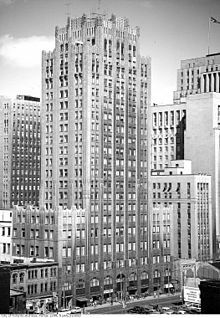 The original Star building at 80 King Street West was demolished to make room for First Canadian Place. The new building originally housed the paper's presses. In 1992, the printing plant was moved to the Toronto Star Press Centre at the Highway 407 & 400 interchange in Vaughan. In September 2002, the logo was changed, and "The" was dropped from the papers. During the 2003 Northeast blackout, the Star printed the paper at a press in Welland, Ontario. Until the mid-2000s, the front page of the Toronto Star had no advertising aside from lottery jackpot estimates from the Ontario Lottery and Gaming Corporation (OLG). On May 28, 2007, the Star unveiled a redesigned paper that features larger type, narrower pages, fewer and shorter articles, renamed sections, more prominence to local news, and less so to international news, columnists, and opinion pieces. However, on January 1, 2009, the Star reverted to its previous format. Star P.M., a free newspaper in PDF format that could be downloaded from the newspaper's website each weekday afternoon, was discontinued in October 2007, thirteen months after its launch. On January 15, 2016, Torstar confirmed the closure of its Vaughan printing presses and that it will outsource printing to Transcontinental Printing, leading to the layoff of all 285 staff at the plant as Transcontinental has its own existing facility, also in Vaughan. In 2018, the Toronto Star expanded its local coverge of Vancouver, Calgary, Edmonton and Halifax with rebranded daily newspapers, previously known as Metro, as StarMetro. In 2018, the Toronto Star aquired iPolitics, a political news outlet. Like its competitor The Globe and Mail, the Star covers "a spectrum of opinion that is best described as urban and Central Canadian" in character. The Star is generally centrist and centre-left, and is more socially liberal than The Globe and Mail. The paper has aligned itself over the years with the progressive "Atkinson principles" named for publisher Joseph E. Atkinson, who was editor and publisher of the paper for 50 years. These principles included social justice and social welfare provision, as well as individual rights and civil liberties. In 1984, scholar Wilfred H. Kesterton described the Star as "perpetually indignant" because of its social consciousness. When Atkinson's son Joseph Story Atkinson became president of the Star in 1957, he said, "From its inception in 1892, the Star has been a champion of social and economic reform, a defender of minority rights, a foe of discrimination, a friend of organized labour and a staunch advocate of Canadian nationhood." Another of the "Atkinson principles" has been a "strong, united and independent Canada"; in a 1927 editorial, the paper wrote "We believe in the British connection as much as anybody does but on a self-respecting basis of equality, of citizenship, and not on the old basis of one country belonging to the other." The paper was historically wary of American influence, and during the debates over the North American Free Trade Agreement, the paper was frequently critical of free trade and expressed concerns about Canadian sovereignty. The paper has been traditionally supportive of official bilingualism and maintaining Canadian unity in opposition to Quebec separatism. In the 1980s, Michael Farber wrote in the Montreal Gazette that the Star's coverage was Toronto-centric to the point that any story was said to carry an explanation as to "What it means to Metro." Conversely, Canadian sociologist Elke Winter wrote in 2011 that the Toronto Star was less "Toronto-centric" than its rival, The Globe and Mail, writing that the Star "consciously reports for and from Canada's most multicultural city" and catered to a diverse readership. In the 50 years to 1972, the Star endorsed the Liberal Party in each federal general election. In the 14 federal elections between 1968 and 2015, the Star endorsed the Liberal Party ten times, the New Democratic Party two times, and the Progressive Conservative Party two times. Elections in which the Star did not endorse the Liberals took place in 1972 and 1974, (when it endorsed the Progressive Conservatives), and 1979 and 2011 (when it endorsed the NDP). In the 2011 election in which the Star endorsed the NDP under Jack Layton, but to avoid vote-splitting that could inadvertently help the Conservatives under Stephen Harper, which it saw as the worst outcome for the country, the paper also recommended Canadians vote strategically by voting for "the progressive candidate best placed to win" in certain ridings. For the 2015 election, the Star endorsed the Liberal Party under Justin Trudeau. In Toronto's non-partisan mayoral elections, the Star endorsed George Smitherman in 2010, and John Tory in 2014. The Star is one of the few Canadian newspapers that employs a "public editor" (ombudsman) and was the first to do so. Its newsroom policy and journalistic standards guide is also published online. The Star states that it favours an inclusive, "big tent" approach, not wishing to attract one group of readers at the expense of others. It publishes special sections for Chinese New Year and Gay Pride Week, along with regular features on real estate (including condominiums), individual neighbourhoods (and street name etymologies), shopping, cooking, dining, alcoholic beverages (right down to having an exclusive on the anti-competitive practices of the Beer Store that led to major reforms on the sale of alcohol in Ontario grocery stores in 2015 by Premier Kathleen Wynne and Ed Clark), automobiles (as Wheels), and travel destinations. Since the mid-2010s, the sports and business sections are consolidated on some days and eventually, all weekdays. Reliefs recovered from the demolition of the former Toronto Star building on King Street. Located at the Guild Park and Gardens in Scarborough. The advent of the National Post in 1998 shook up the Toronto newspaper market. In the upheaval that followed, editorial spending increased and there was much hiring and firing of editors and publishers. In 1998, the Toronto Star purchased a majority stake in Sing Tao's Canadian newspaper Sing Tao Daily, which it jointly owns with Sing Tao News Corporation. Sing Tao Daily encountered controversy in April 2008, after media watchers discovered the paper had altered a translated Toronto Star article about the 2008 Beijing Summer Olympic Games protests to adhere to Chinese government's official line. Sing Tao's then-editor Wilson Chan was fired over this. In June 2018, the Star announced it was implementing a paywall again and has the same restrictions as its previous paywall implementation. On September 15, 2015, the Toronto Star released the Toronto Star Touch tablet app, which was a free interactive news app with interactive advertisements. It was discontinued in 2017. At launch, it was only available for the iPad, which uses iOS. Based on a similar app for Montreal-based La Presse released in 2013, Star Touch is the first such app for any English-language news organization, quality-wise. In slightly over 50 days since launch, the app had reached the 100,000-download milestone. The Android version was launched on December 1, 2015. The iOS version is rated 12+ by Apple's App Store guidelines and the Android version is rated Mature 17+ by the Entertainment Software Rating Board (ESRB). On January 15, 2016, the Toronto Star announced it would close its printing plant in Vaughan and outsource all print production starting in July 2016. The newspaper said the closure was effected, so it could better focus on its digital outlets. The Toronto Star has seen, like most Canadian daily newspapers, a decline in circulation. Its total circulation dropped by 22 percent to 318,763 copies daily from 2009 to 2015. In February 2018, the Toronto Star suspended its internship program indefinitely to cut its costs. Long a source of Canada's next generation of journalists, the paid positions were seen as a vital part of the national industry, and their suspension, a sign of its continuing decline. The Toronto Star has been located at several addresses from 1892 to 1970. ^ owners of the Riordon Pulp and Paper Company, and investors in The Hamilton Spectator, Toronto Mail and the Toronto Evening News. ^ But the Act's repeal in 2009 does not mean that charities in Ontario can now set up for-profit companies or pursue business activities. ^ "Toronto Star endorses the NDP". Toronto Star. April 30, 2011. Retrieved April 30, 2011. ^ "But vote strategically". Toronto Star. April 30, 2011. Archived from the original on May 3, 2011. Retrieved April 30, 2011. ^ "World Newspapers and Magazines: Canada". Worldpress.org. 2007. Retrieved November 2, 2007. ^ "Star's choice: Dion, Liberals". Toronto Star. October 11, 2008. Retrieved October 12, 2008. ^ "2015 Daily Newspaper Circulation Spreadsheet (Excel)". News Media Canada. Retrieved December 16, 2017. Numbers are based on the total circulation (print plus digital editions). ^ "Toronto Star". The Canadian Encyclopedia. July 21, 2009. ^ "Circulation Report: Daily Newspapers 2015". Newspapers Canada, June 2016. ^ "Toronto Star Newspapers Ltd". Bloomberg. Retrieved March 8, 2018. ^ Editors, The. "The Toronto Star | Canadian newspaper". Britannica.com. Retrieved February 15, 2019. ^ Archer 1947, p. 3. ^ a b Sotiron 2005. ^ Archer 1947, pp. 4–5. ^ Archer 1947, pp. 5–6. ^ a b Archer 1947, p. 6. ^ Otto, Stephen A. (2005). "Larkin, Peter Charles". In Cook, Ramsay; Bélanger, Réal (eds.). Dictionary of Canadian Biography. XV (1921–1930) (online ed.). University of Toronto Press. ^ "A Canadian Observer". Vancouver Holocaust Education Centre. ^ Phillips, Andrew (November 1, 2017). "125 years of speaking out". Toronto Star. Retrieved January 23, 2018. ^ Powell, Betsy (November 6, 2002). "Atkinson's will kept Star's resolve". Toronto Star. Toronto. Archived from the original on October 23, 2012. Retrieved January 12, 2011. ^ Bourgeois, Donald. "The Charitable Gifts Act: A Commentary". Retrieved January 12, 2011. ^ Lazier, Kate; Manwaring, Susan M. (December 2009). "Ontario Government passes Good Government Act that includes positive changes for charities" (PDF). Miller Thomson. ^ Martin, Sandra (November 8, 2005). "Beland Honderich, 86". The Globe and Mail. ^ "Atkinson Principles". Torstar. Retrieved August 2, 2013. ^ "Information Circular" (PDF). Torstar. March 1, 2016. pp. 3–5. ^ Zerbisias, Antonia (February 20, 2006). "Kartoon Kontroversy Kontinues". Archived from the original on March 23, 2006. Retrieved August 2, 2013. ^ a b c Plummer, Kevin (March 22, 2014). "Historicist: An Invisible Giant". torontoist.com. ^ "Torstar's Vaughan Press Centre celebrates 20th anniversary". Toronto Star. ^ Kuntz, J. Fred (May 28, 2007). "You spoke, we listened: Here are the changes". The Star. Toronto. Retrieved May 25, 2010. ^ "Torstar to sell printing plant in Vaughan, close to 300 jobs affected". toronto.citynews.ca. ^ "Torstar hiring 20 reporters as it rebrands and revamps Metro Urban dailies across Canada". Financial Post. The Canadian Press. ^ Healing, Dan. "StarMetro? Toronto Star publisher rebranding free daily newspapers across Canada - cites appetite for 'progressive voice'". Calgary Herald. The Canadian Press. Retrieved March 30, 2019. ^ Popplewell, Brett. "Inside the Toronto Star's Bold Plan to Save Itself". The Walrus. Retrieved March 30, 2019. ^ "Tortar signs agreement to purchase political website iPolitics". CBC. Retrieved March 30, 2019. ^ "Torstar to purchase iPolitics media outlet". Cision. Retrieved March 30, 2019. ^ a b c Elke Winter, Us, Them and Others: Pluralism and National Identities in Diverse Societies (University of Toronto Press, 2011), p. 96. ^ a b c Kenyon Wallace, How the Star is making its political endorsements more transparent, Toronto Star' (May 26, 2018). ^ a b c d e f Tamar Harris, Through constant change, Atkinson Principles endure, Toronto Star (November 4, 2017). ^ Perrella, Andrea M.L. (1995). Guy Lachapelle (ed.). "Editorials and the Free Trade Agenda: Comparison of Law Press and the Toronto Star Quebec Under Free Trade: Making Public Policy in North America". Quebec Under Free Trade: Making Public Policy in North America. Presses de l'Université du Québec: 276–79. ^ Farber, Michael (August 27, 1985). "Stock deal ends talk of takeover". Montreal Gazette. p. A-3. ^ a b Kathy English, Why do newspapers endorse?, Toronto Star (October 11, 2008). ^ "Toronto Star endorses the NDP". Toronto Star. April 30, 2011. Retrieved May 1, 2011. ^ "Toronto Star endorses Liberal leader Justin Trudeau for prime minister". Toronto Star. October 9, 2015. ^ "The Star's choices for Toronto mayor: George Smitherman". Toronto Star. October 17, 2010. ^ John Tory is the best choice to lead Toronto: Editorial, Toronto Star (October 21, 2014). ^ Toronto Star Newsroom Policy and Journalistic Standards Guide | Toronto Star. Thestar.com (December 7, 2011). Retrieved on August 17, 2013. ^ "As the Globe turns - Macleans.ca". Macleans. July 9, 2009. Retrieved November 14, 2017. ^ Orth, Maureen. "Black Mischief". The Hive. Retrieved November 14, 2017. ^ "Newspapers in Canada". The Canadian Encyclopedia. ^ a b "Lost in Translation". Toronto Life. August 2008. Archived from the original on November 12, 2010. Retrieved February 22, 2013. ^ "Star Media Group". Torstar Corporation. Retrieved February 22, 2013. ^ "Editor Dismissed Over Pro-Beijing Edits, Say Sources". The Epoch Times. April 9, 2009. Retrieved February 22, 2013. ^ "The Star to launch digital subscription". Toronto Star. ^ "Toronto Star launches digital subscriptions: Publisher". Toronto Star. ^ "Toronto Star moving behind paywall". CBC News. August 13, 2013. Retrieved February 18, 2019. ^ "Note to Readers: Star to end paid digital subscriptions on April 1". Toronto Star. ^ "Toronto Star makes news with innovative Star Touch tablet app". Toronto Star. ^ "Toronto Star Touch hits 100,000 downloads. Have you tried it?". Toronto Star. ^ "Toronto Star Touch launches on Android". Toronto Star. ^ SUN, Toronto; News; Money; Share Torstar lays off more than 300 production, editorial staff; Tumblr; Pinterest; Plus, Google; Reddit; LinkedIn; Email; superjumbo, Airbus pulls plug on iconic A380; certification, BuzzFeed Canada staff file for union; wallets', $460Gs in QuadrigaCX cryptocurrency disappears into 'cold (January 15, 2016). "Torstar lays off more than 300 production, editorial staff, selling staff - Toronto Sun". ^ "Daily Newspaper Circulation Data". News Media Canada. Retrieved December 16, 2017. ^ "Daily Newspaper Circulation Data". News Media Canada. Retrieved December 16, 2017. Figures refer to the total circulation (print and digital combined) which includes paid and unpaid copies. ^ "Toronto Star Suspending Internship Programs Indefinitely". Canadaland. ^ "Why the Toronto Star internship program was unique". J-Source. February 21, 2018. ^ Hughes, Kim (May 18, 2008). "The soundtrack of a generation". Toronto Star. Retrieved September 28, 2010. ^ Hughes, Kim (July 8, 2007). "They loved, lusted, lost". Toronto Star. Retrieved September 28, 2010. ^ "Harper finds new communication director in ranks of ethnic media" Archived September 6, 2011, at the Wayback Machine. The Globe and Mail, August 31, 2011. ^ Gordon, Cameron. "Toronto's Star... Ben Rayner In a rockcritics.com interview". Rockcritics.com. Retrieved September 8, 2013. ^ "Ben Rayner". Toronto Star. Retrieved September 8, 2013. ^ "History of the Toronto Star". Toronto Star. Retrieved April 5, 2017. Archer, William L. (1947). Joe Atkinson's Toronto Star: The Genius of Crooked Lane. Montreal. Harkness, Ross (1963). J.E. Atkinson of the Star. Toronto: University of Toronto Press. OCLC 1402965. Rutherford, Paul (1982). "Riordon (Riordan), John". In Halpenny, Francess G (ed.). Dictionary of Canadian Biography. XI (1881–1890) (online ed.). University of Toronto Press. Sotiron, Minko (2005). "Maclean, William Findlay". In Cook, Ramsay; Bélanger, Réal (eds.). Dictionary of Canadian Biography. XV (1921–1930) (online ed.). University of Toronto Press. Templeton, Charles (1983). "Inside the Toronto Star". Charles Templeton, an anecdotal memoir. Toronto: McClelland & Stewart. ISBN 978-0-7710-8545-1. OCLC 11158533. Retrieved February 13, 2010. Vincent, Trista (March 1999). "Manufacturing Concern :: Ryerson Review of Journalism". Archived from the original on March 27, 2012. Retrieved January 6, 2011. Walkom, Thomas L (1994). Rae Days. Toronto: Key Porter Books. ISBN 978-1-55013-598-5. OCLC 30669140. Wikimedia Commons has media related to Toronto Star.